Effective Oven Cleaners in TW7 Isleworth | RDA Cleaning & Maintenance Ltd. Trying to renew your previous desire to live healthy, which involves healthy domestic food? Don't forget to clean the oven in a natural way, then. Try the organic and smart expert oven cleaning service in Isleworth TW7 our company has designed for you! The burnt out stains and the greasy surface should be in past, because the oven must be shiny and healthy! Rely on the diligent and experienced oven cleaners. Call them in your house and let them show you how the innovative oven cleaning service works. Make an order for the service via this phone number 020 3404 1646 ! We are available for your questions and reservations 24/7! First-Class Oven Cleaners In Isleworth TW7. Quality Ensured! Forget about hiring a company with no experience or bad reputation in the field. Chose the company with more than 10 years of experience in oven cleaning services Isleworth TW7. Hire the company with more than 5 thousand of new happy customers per year. The company with 96% positive feedback on all of the offered services, including the efficient and innovative oven cleaning. Hire RDA Cleaning & Maintenance Ltd. your friend in maintaining sparkling clean kitchen and cooking organic and safe meals in a hygienic and fresh oven! 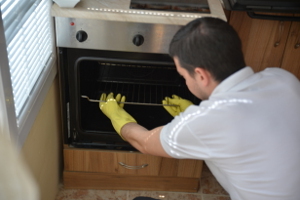 As a professional oven cleaning company Isleworth TW7 we hire only well-trained and educated cleaning technicians to deal with different stain types and different level of dirt. No matter how bad the situation is, they will do everything possible to restore the freshness of your device. So if you are done with your choice. If you want to hire an expert oven cleaning Isleworth TW7 provider, that will do everything in their power bring you only the best of services. Then please feel free to give us a call at 020 3404 1646 or use our online booking form. This way we will be on our way as quick as possible to bring you the satisfaction of owning one of the cleanest kitchens in the entire London!